Tifftags, a program to reviel and retrieve all tiff header information. Use tiff tags to investigate all header information in tiff files. In version 5, tifftagslister is integrated and in a registered version one could export alle tag header information for all pages to csv format. Download your copy at Scancare (no installation required. Just unzip and execute). 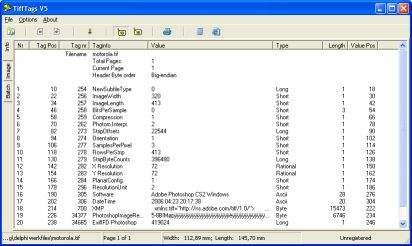 PDF PageCount: Count pdf pages without Adobe Acrobat installed ! A new application that counts the pages within pdf files without any need to install any Acrobat products. Download a fully functional copy here . The unregistered version is fully functional, but does have a small delay within the startup and between the results. A version without any limitations could be ordered for only 5 euro. More info could be found within the application. 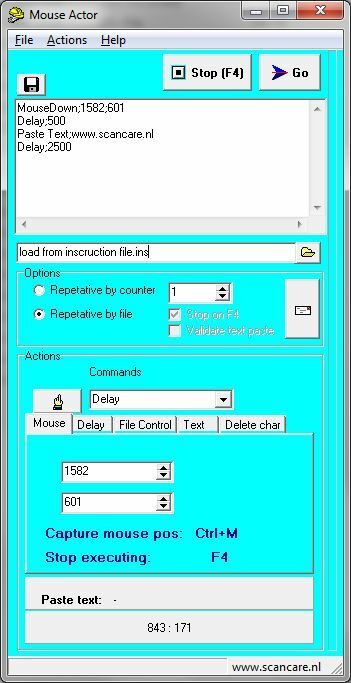 A program to program yourself some mouse actions . Step by stap the actions could be controlled. Screens are self explaing. Also it is possible to add nummeric keystroked: records could be located via a controller file and tekst/numbers could be added to be pressed. This is a beta release designed for own use. If you lack some actions, please send a letter. If this application has to be tailered for your whishes , please add some ideas for new features. Processes files one directory at a time: first bakcup up the extention, then renaming it ro a new name. V2: ability to add a prefix to a name. - ability to change the file date to current date. If you do like these programs, please visit my sponsors at www.scancare.nl.